The FLY-X3-Plus from ikan is a motorized 3-axis powered gimbal designed to keep your smartphone level as well as isolate it from hand shake. It features a 6-axis Inertial Measurement Unit (IMU) that levels and anticipates the operator's movements for smooth footage. Between the included mounting adapters, you can attach small and large smartphones up to 3.6" wide, such as the iPhone 6 Plus and Galaxy S5, as well as the GoPro HERO4 and HERO3 action cameras. The FLY-X3 stabilizes footage shot with your smartphone although it is not designed to hold your smartphone perfectly still; rather it compensates for shake when moving and provides an organic-looking stabilized shot. 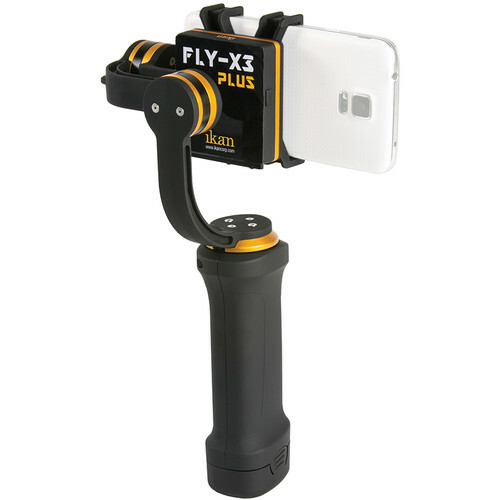 FLY-X3-Plus 3-Axis Smartphone Gimbal Stabilizer with GoPro Mount is rated 3.8 out of 5 by 35. Rated 5 out of 5 by Stephen from Outstanding tool for camera smartphone film maker! I'm producing a documentary film and hate lugging my Nikon D750 or Panasonic AC-160 cameras around and have always struggled with stabilization. I have a tremor! The Ikan is simple to setup and enables me to capture great video with elegantly smooth moves and incredibly stable shooting. I used it this past weekend to capture footage and interviews at the DC Funk Parade in our nation's capitol. Those who noticed it, asked about it and decided I need that! Others just took for granted that my media pass coupled with the Ikan Fly made me a pro and treated me with the respect I need to shoot in crowds and get the content I need in close quarters and on the street. Tonight I'm capturing interviews and interactions at a social event. When I told the sponsors I wanted to bring my camera, they told me there was no room for a tripod, so the Ikan Fly is PERFECT. I'm also taking a Zoom H1with aux mic plugged in to get better sound from my subjects. Amazing value an tool for the professional and amateur shooter using a smartphone - in my case, the iPhone 6. When the iPhone 7 comes, I'll be there with my Ikan for even more and better video. Rated 5 out of 5 by Ali from Very easy to set up for iPhone 6 plus and 6s plus I just put it on there and a little bit of moving the counter balance and had it balanced within 5 minutes. The movement is smooth and this opens up a lot of possibilities and such a low price point. I haven't had any issues with it. I just wish there was a way I could put on my Robe Video Mic Me on my iPhone while using it but I can't as it interferes with one of the motors. So, you basically are limited to the iPhone microphone which will likely pick up some sound. This is pretty much a dual sound set up unless you're using it for home videos. Rated 1 out of 5 by Mike from Background Noise from Motors I use it with the GoPro mount and also with the iPhone6, and besides the background noise coming from the gimbal motors it is great. The motor noise is quite loud, when filming and an external microphone is needed, if you want to avoid that problem. I see video from other gimbals on youtube, and they don't seem have to have that problem. Therefore i would not buy it again. Rated 1 out of 5 by Richard A. from Stopped working in less than a year I bought the iKan Fly X3 Plus almost 18 months ago. Before the first year was up the unit stopped working. I called support and they told me the battery needed to be replaced. I sent the battery back to them. It took six weeks to get a new battery and when I got it, the X3 still didn't work. I called them again and told them the unit still didn't work. They gave me another RMA and said to send back everything but the battery. I did. Three months later I got it back. I put the battery in and it didn't work. I will never buy an iKan product again. Unreliable product and terrible customer support. Rated 5 out of 5 by Anonymous from Smooth and efficient Perfect as a small business or familiar tool. It's smooth and very easy to use. After just a little practice you get a grip on how to balance it properly. The only con: A tiny screw that holds the counterweight can be easily lost. So be careful with that one. Rated 5 out of 5 by Casmirri from Smoooooth Shots with my iPhone 6S+ First thing you'll notice: a very well-made, precision product. Pretty easy to set up and get started with, too. There's a little counter-balance for larger devices like the iPhone 6S+, and it really works well. Might just get rid of that old vest/arm/stabilizer and start shooting motion shots with this baby! What with the video quality of the iPhone and how well this gimbal works, you can get some amazingly useful shots with this combo. Comes in a nice case, too, with space for an extra battery (good idea, but the battery seems to last a very long time.) Very pleased with this purchase! Will this work with the GoPro Hero5? The GoPro Hero5 may not work properly on this Gimbal Stabilizer. However GoPro Hero5 specific stabilizers are starting to be released, with Feiyu offering B&amp;H #FEFYG5. You can also take a look at the Karma Grip from GoPro, which is B&amp;H #GOKG. Can you mount the phone portrait? Not being able to shoot in portrait mode means I can't use this with Periscope. Would be a helpful feature. What is the difference between the Ikan FLY-X3-Plus and Lanparte HHG-01 ?? Both of these gimbals will do smartphones and GoPros. The ikan has one included GoPro mount and an additional optional one. Landparte does not have a GoPro mount included. Once you add that mount the price is not as different. Unfortunately there is no available direct comparison between these two. Differences to look for would be how well they work and the build quality. At this time the Landparte may be the one to go for. the rebate form is not clear of what to expect back for purchasing ? How much is the rebate ? This product is eligible for a $149 rebate ultimately, as the rebate criteria from Ikan is that they will provide a rebate check in the amount (USD) of the difference between the purchase price (less taxes, any other discounts, shipping and handling) and $199 USD, up to a total rebate price of $149. The battery will last about 2-3 hours. It takes 2-3 hours to charge fully. Battery capacity is 16.6 watt/hour. Thanks for the question! Will the gopro4 work with this? My GoPro 4 silver works with it well. It seems as though this gimbal doesn't yet accept the GoPro 4Session cams yet. Is this a correct assumption? This is correct. However, we do have the FLY-X3-GO gimbal that can be equipped with the Session Mount to fit the GoPro Session. Can it handle the iPhone 7 Plus? Michael, We've been getting this question quite a bit since the release of the iPhone 7+. We haven't had a chance to check this in-house, but looking at the specs available online for the 7+ and the capacity of the gimbal itself, it should be able to work. You will probably have to remove any phone case, and use counterweights.